..... Hamo sashimi, a speciality of the Kyoto area in Summer. It is hacked very finely because of the many small bones and takes an experienced cook to prepare it properly. - - - - - The following are NOT kigo. It has been eaten in Osaka since olden times. This eel can be caught all year round, but it is hard nowadays to feed them properly. The fish likes the mix of seawater and river water that he has in the wetlands of the bay. Fishermen go out to catch small prawns during the ebb tide and put it back into the water to feed the eels, but this is very hard work. The fish is blanched. A dressing is of vinegar and soy sauce. Decorated with grated rasish and cucumbers. Mizore-ae is also used for other ingredients like chicken meat. 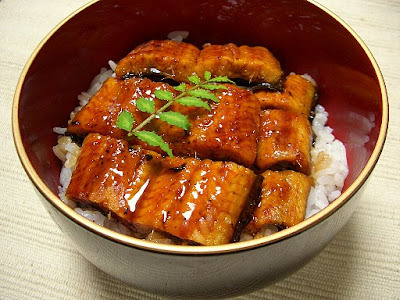 One of the most famous eel dishes. Here the sauce is poored directly over the eel and the rice. gegrillter Aal auf einer Schüssel mit Reis. Sometimes the eel is served in a separate laquer box and the rice, soup and pickles come in separate dishes. Kabayaki was already prepared in the Muromachi period. First the whole fish was put on a pole and grilled (Ujimaru kabayaki 宇治丸, uchimaru うちまる), but that did not go well so it was cut open and put on skewers. Sometimes it was also grilled with salt only (shioyaki 塩焼) or (shirayaki 白焼, white grilling). This dealer, kabayaki uri 蒲焼売 could carry his "shop" on a pole over the shoulders. He could set up shop at any place. Other dealers grilled the fish at home and sold only the pieces. In Edo, eel was cut open from the backside, whereas in Osaka (Kamigata) and Kyoto it was sliced open from the stomach. 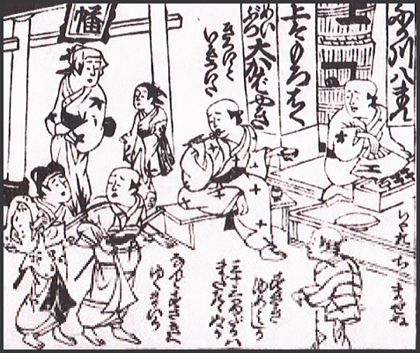 In Edo there lived many Samurai and "harakiri", cutting the stomach, was notfavored. In Edo the bones are taken out, then the fish is cut in three pieces, which are put on skewers and grilled separately. They are served with the skewers. In Kamigata / Osaka fish is cut from the stomach, the bones are taken out, the whole fish is put on skewers from head to tail, and after grilling the skewers are taken out and the pieces placed on a broad dish. In Tokyo it is first simmered, then grilled. In Osaka it is not simmered. 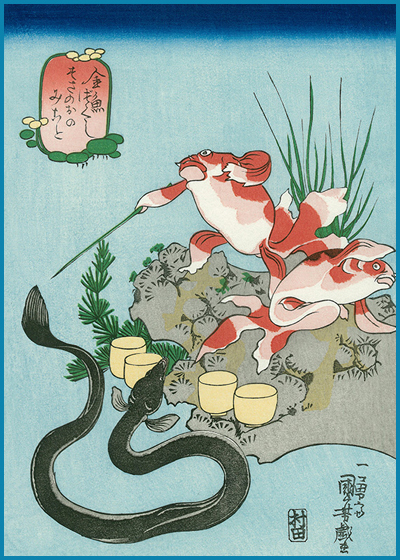 Unagi was often featured in Ukiyo-e prints of Edo. Miyatogawa　宮戸川, now Sumidagawa. Eel was taken out with poles. 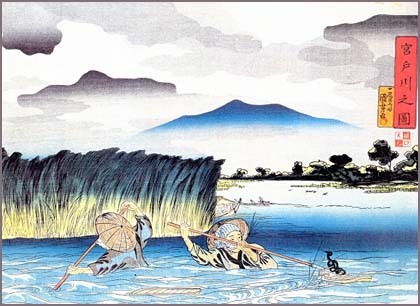 In a book published in 1697, the author already praized the eel from Miyatogawa in Edo 江都（えど）as the best in all Japan. Often with red miso. Or a clear broth with some eel liver.
. . . CLICK here for kimosui clear broth Photos ! Many restaurants have a sauce which is the strict secret of the generations. Ready-made sauces are also available in the stores. 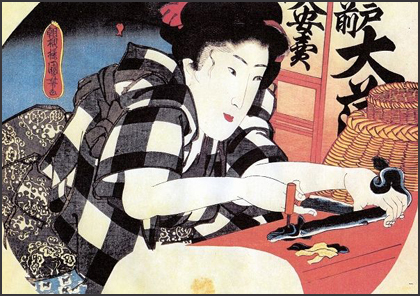 There were quite a few in Edo where women prepared the fish, from cutting it to grilling it. 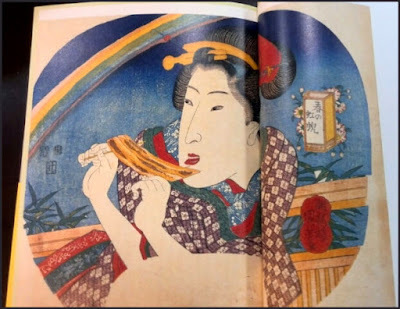 The Ukiyo-E prints were often in the format of a summer hand-fan, to be used to feel cool, spread the delicious smell of grilled fish and attract customers. The characters on their kanban shop signs are usually very typical. A dish from the Kansai area. Similar to mizore-ae, but the fish has been broiled. The sauce is quite sweet. Sanbaizu vinegar is used. The fish is rolled around pieces of goboo burdock. yahata maki can also be made with other ingredients like pork meat or dojoo loach. Fresh burdock from the area of Iwashimizu Hachimangu 石清水八幡宮 is usually used. A speciality of Yahata town, Kyoto. In the beginning it was the other way around, on days when fish was not to be eaten for religious regions during the Hojo-e ritual of releasing fish into the river. cooks prepared small river fish and wrapped it in stripes of burdock to hide it. The river where the fish were released often clogged and was cleaned. The mud was taken to the nearby fields as compost for the burdock. Sansho, Sanshoo, Japanese pepper, "Mountain pepper"
Lake Hamanako 浜名 near Hamamatsu, Shizuoka is famous for its eel farming. Many shirasu elvers are raised here. shirasu no kama-age　しらすの釜揚げ boiled shirasu. they are boiled in salt water, which can be heated a bit higher than 100 degrees centigrade. After skimming off the foam various times they are put on nets to dry. 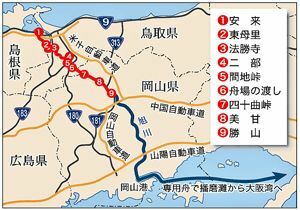 From Izumo, 安来港 Yasugi port over the mountains to 勝山町 Katsuyama (Okayama). From Katsuyama by boat downriver to Okayama, from there to Osaka. The porters had to be very strong to carry about 30 kg of eel in two baskets on shoulder poles, stopping every 4 km to water the fish, running day and night for four days. Along the road were houses with Unagi ponds especially for this transport. The most difficult part was the pass 四十曲峠 Shijumagaritoge with 40 bending curves. The runners were under the special protection of 聖護院宮　Shogoin no Miya, a temple in Kyoto and ferry boats had to come back from the river to give them a first go.
. Kaido: The Ancient Highways 日本の街道 . It seems eel is not eaten much in America. The American eel, Anguilla rostrata, is a catadromous fish found on the eastern coast of North America. It has a snake-like body with a small sharp pointed head. It is brown on top and a tan-yellow color on the bottom. It has sharp pointed teeth but no pelvic fins. It is very similar to the European eel, but the two species differ in number of chromosomes and vertebrae. In 2010, Greenpeace International has added the american eel to its seafood red list. " The Greenpeace International seafood red list is a list of fish that are commonly sold in supermarkets around the world, and which have a very high risk of being sourced from unsustainable fisheries." Räucheraal, smoked eel, was especially popular during the Christmas holidays.
. Eel catch problems . Thank you for many kind topics on eel that I like very much. Especially Unagi haiku is excellent! You are truely expert of cocking. Thanks for your consistent wonderful haikus. Mouth-watering, too. Though shirasu, or whitebait, usually refers to the fry of katakuchi-iwashi or Japanese anchovy, there actually are two other kinds of sardine fry--ma-iwashi, or Japanese sardine, and urume-iwashi, or round herring. 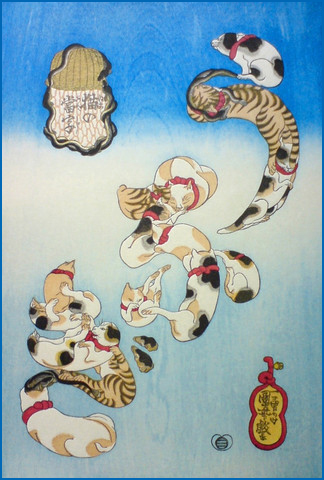 Nama-shirasu, or raw shirasu, refers to shirasu that have been washed in water. Kamaage-shirasu are shirasu lightly boiled in salted water and drained. Chirimenjako are dried kamaage-shirasu. When nama-shirasu are molded on postcard-sized wooden frames and dried, they are called tatami-iwashi. West of Miura Peninsula and the Shonan coastal area, including waters off Kamakura, Kanagawa Prefecture, are good places to catch shirasu. The shirasu fishing season began on March 11, and in early April shops put up signs proclaiming "Shirasu in stock!" The signs are an annual spring feature of the area. I recently visited Kanhama Suisan, a company that processes and sells shirasu at Koshigoe fishing port, located at the western edge of Kamakura. Fresh shirasu caught near the fishing port by Nobukazu Mizushima, the third-generation president of the company, were being brought into a shed in refrigerated boxes. Mizushima's wife, Yoshie, sat in front of a huge steel pot as big as a bath and added natural salt to the boiling water, before placing washed shirasu into it and quickly closing the lid. A few minutes later, after peering inside the pot, she removed the lid and scooped out the shirasu using a long-handled strainer. "Experience is the most important thing when boiling shirasu. The amount of salt and the boiling time differ each time," Yoshie said. "I don't use a watch. I just look inside the pot when I think it's about time." I tasted some of the freshly boiled shirasu and the light seasoning of salt really brought out the excellent flavor of the fish. If you are keen to taste fresh shirasu, I recommend you visit the areas where they have just been caught, as nama-shirasu caught on the day is seldom available elsewhere. 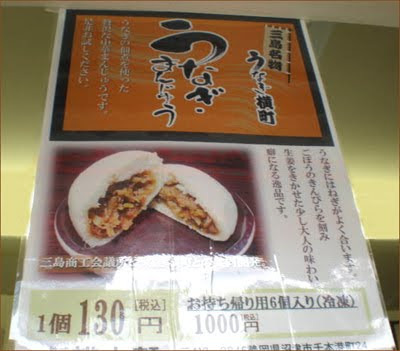 As nama-shirasu spoils quickly, it is best consumed within 12 hours after being landed. The government has designated the Japanese eel an endangered species due to a sharp decline in its population. The Environment Ministry added the eel to its Red List of threatened species. The eel is listed as IB, the second highest category in terms of risk of extinction. The population of wild Japanese eels is estimated to have dropped by at least 50 percent over the past 10 years. Experts blame overfishing and water pollution. The Red List designation does not restrict fishing or trading of the eel as it is not legally binding. Environment Minister Nobuteru Ishihara said the eel is an indispensable part of Japanese culinary culture. He pledged all-out efforts to conserve the eel. A group of international scientists is considering designating the Japanese eel as a species at risk of extinction on its red list, according to sources. The International Union for Conservation of Nature and Natural Resources, or IUCN, will discuss the matter at a meeting to be held in Britain from July 1 to 5, the sources said Saturday. While it does not bring about any legal binding force even if the species is listed on the world’s most authoritative red list, it would raise global awareness. The Japanese eel, whose population is decreasing in East Asia, was designated as a species at risk of extinction on the Environment Ministry’s nonlegally binding red list of endangered freshwater and brackish water fishes in February. The first DONBURI was invented in Edo. 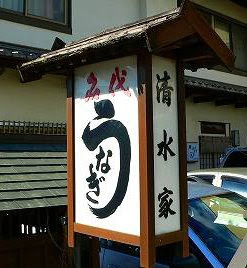 A rich merchant used to order kabayaki　蒲焼 grilled eel and wanted to eat it hot. But while the servant was fetching the food, it had cooled down. So the merchant got the idea to place the grilled fish on hot rice during the carrying of the fish to his store . . . and this soon became the custom with other food that tastes best when served hot.